When selecting a new vehicle, finding the right set of features can be an important decision. Our team here at NorthStar Ford want to make that process simpler and are here to help. 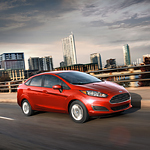 When you step inside this popular subcompact car, you can create a personalized and comfortable interior. The available ambient lighting can help set the mood with different colors to choose from at a touch of a button. Sedan or hatchback? You can choose between two different styles that can match your needs. Both options give ample storage space and can add additional storage with the 60/40 folded seating to make sure everything can go on the trip. These are just some of the features available on the 2018 Ford Fiesta. We invite you to visit our team here in Duluth to take one out for a test drive today.